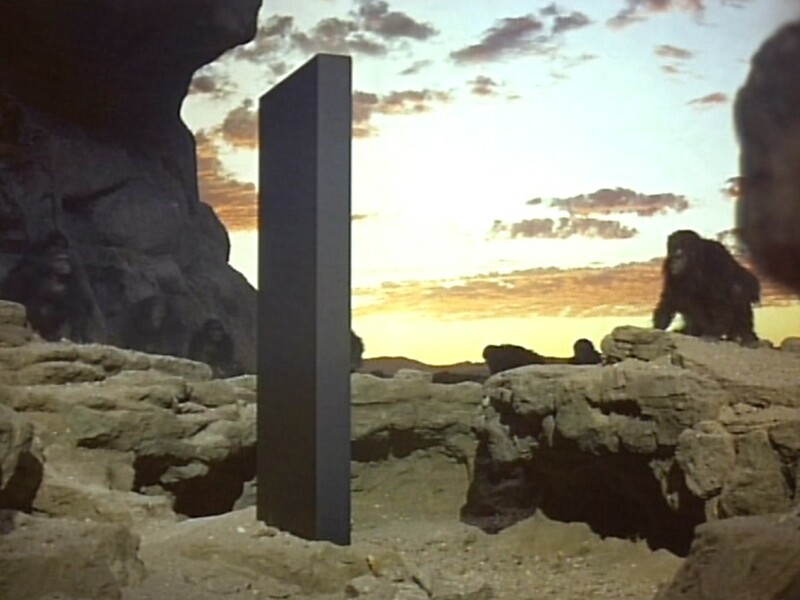 The concept of a simian creature and a megalith would have brought to mind for me, until recently, the black monolith scenes near the beginning of Stanley Kubrick’s film 2001 A Space Odyssey. Yet during a recent fieldtrip to a garden centre in East Renfrewshire I experienced a very different and unexpected monkey / megalith juxtaposition. My initial objective had been to explore the enduring desirability of stone and rock that a garden centre / standing stone connection suggested, but I ended up finding much more than I bargained for. People like to go to garden centres to buy stones. Big bags of aggregate and decorative stones, aesthetically pleasing lumps of granite and slate, slabs of concrete, paving stones, bricks and other building materials, or little flat pebbles with ‘welcome to my garden’ written on them. This suggests that stone is a desirable material, even in the 21st century, and indeed it seems likely stone has always been a desirable material for people. In prehistory, stone was used to construct some of the most enduring and awesome monuments ever constructed, and it is probable that the rock used was prized for its physical and symbolic qualities. Large flat outcrops were selected for artistic doodlings in the form of abstract cup-and-ring marks, while still larger igneous intrusions and rocky hilltops became a focus for monumentality and deposition. Silica-rich stone such as flint and chert were much sought after for making tools that were carefully worked from pebbles found on beaches, sourced from surface outcrops, or recovered from deep under the ground in ‘mines’. And certain special rock types were highly desirable – gneiss, porcellanite, jadeite – and were shaped into polished stone axes, objects that likely drew some of their power from the mountainside locations the stone was sourced from and the deep colours revealed by many hours of polishing. It was not called the Stone Age for nothing. 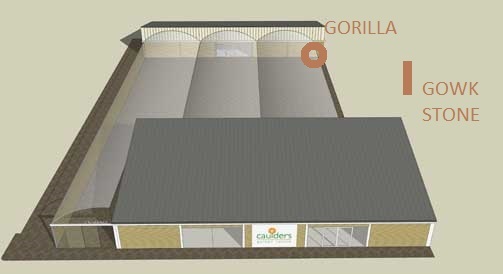 This is a relatively new garden centre, with construction starting in 2008. The building was designed by Crichton + Simpson architects, with an explicit connection made between the layout of the garden centre and the standing stone. The architect’s themselves describe the garden centre as ‘Two simple building forms, arranged around the historical ‘Gowkstone’ creating a retail building and coffee shop’ suggesting that the megalith was a principle element of the architectural design process. Yet when I visited the garden centre, I was struck by the lack of impact that the standing stone makes on the visitor. Far from being centrally located, it sits overlooking the central courtyard area of the garden centre, perched on a rocky prominence in long grass. It is inaccessible, not indicated by any signs and in some places quite difficult to see due to gorse and other vegetation. Despite the claims of the business and designers, there is nothing about the architecture here that draws attention to the Gowkstone. However, it is visible to a greater or lesser extent from more or less anywhere within the ‘outdoor’ part of the garden centre (some of which is actually under cover) for anyone who cares to look beyond the display of wooden garden furniture and shelves of garden products. But the megalith seems to fade into the background, and look like – to me – just another one of the weird decorative items that adorn the garden centre, which of course include the aforementioned gorilla. One of the most striking aspects of this garden centre is the inclusion of a number of fibreglass animals in the undergrowth of displays, such as a cow and a giraffe, and most memorably, a big gorilla which lurks in some vegetation at the corner of the building which hosts the café. 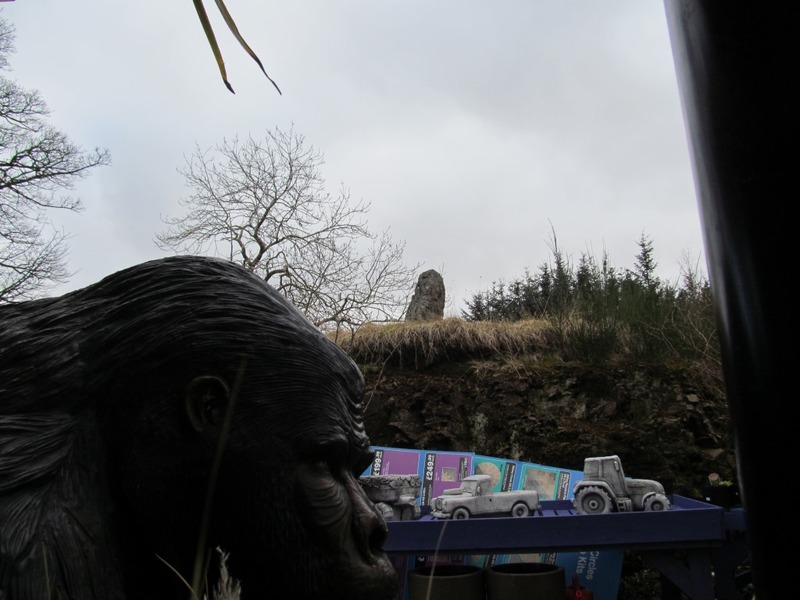 Disappointingly for me, the Braidbar gorilla stares impassively off into the middle distance with no apparent interest in the nearby standing stone. This is an obvious contrast to the hyperactive enthusiasm that the early hominids in 2001 A Space Odyssey display towards the mysterious black monolith that suddenly appears in their midst. I suppose we could mix up the movie metaphors further and note that chimps (which the hominids around the black monolith resemble) are the inquisitive, scientifically minded monkeys in Planet of the Apes and those who actually are archaeologists in the film, whereas the silverback gorillas are miserable gits with guns and are just the kind of ape who couldn’t care less about a megalith. But what of the standing stone itself? Very little is known about this megalith, although it has a few relatively modern associations, and I suppose there has to be some serious doubt that it is prehistoric in origin at all. Remarkably, this standing stone was only relatively recently added to the National Monuments Record of Scotland (NMRS site number NS55SW 228). The stone was added to the NMRS after it was recorded during a survey in 2009 undertaken in the area by the Association of Certificated Field Archaeologists. 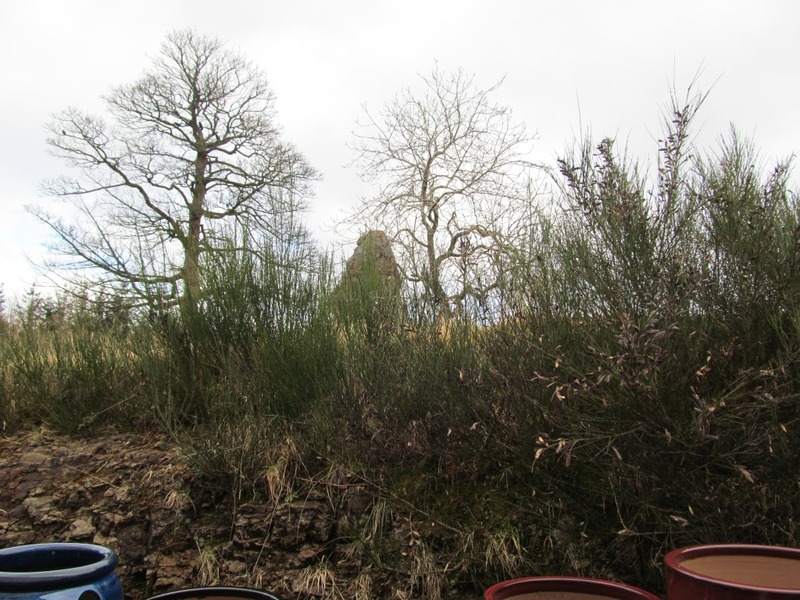 ACFA teams, notable Susan and Robin Hunter, have for some time been carrying out an exhaustive survey of the parishes in this part of East Renfrewshire and around Eaglesham (the Eaglesham Farm Project). They recorded the stone as being 1.6m high, with a girth of 1.1m at the base, tapering to 0.4m by 0.8m at the pointed top. 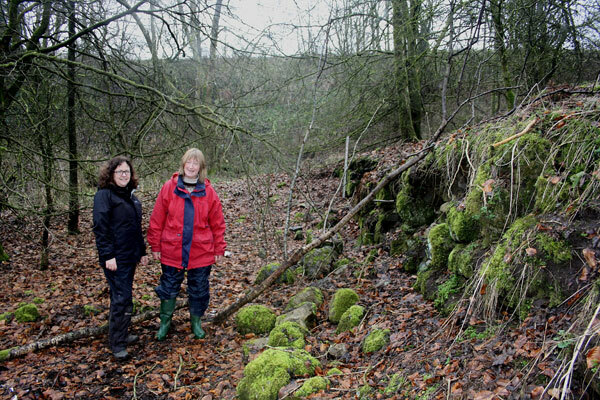 The Hunters suggested that the stone was – ironically – a garden feature associated with the nearby Hazeldean House! This standing stone has a few other associations, although none of these appear to be especially strong. Online one can find connections being made between this standing stone and the Covenanters, or a so-called ‘speaking stone’ recorded in Bishop Pococke’s Tours through Scotland (1760). But ultimately, we have no real way of knowing the age or provenance of this megalith without further research or invasive fieldwork. The Gowkstone is marked on the 1st edition 6 inch OS map for this area (surveyed in 1856) and this map shows that the stone stands on an ‘island’ within an area that had once been a quarry: evidently the quarrying was not permitted to remove the stone (long before ancient monument legislation, this was probably a decision made by the landowner or the quarriers themselves), although rock extraction left a stone island of only about 10m diameter, leaving the megalith isolated, and in itself this act of mercy is no indicator of the antiquity of the stone. 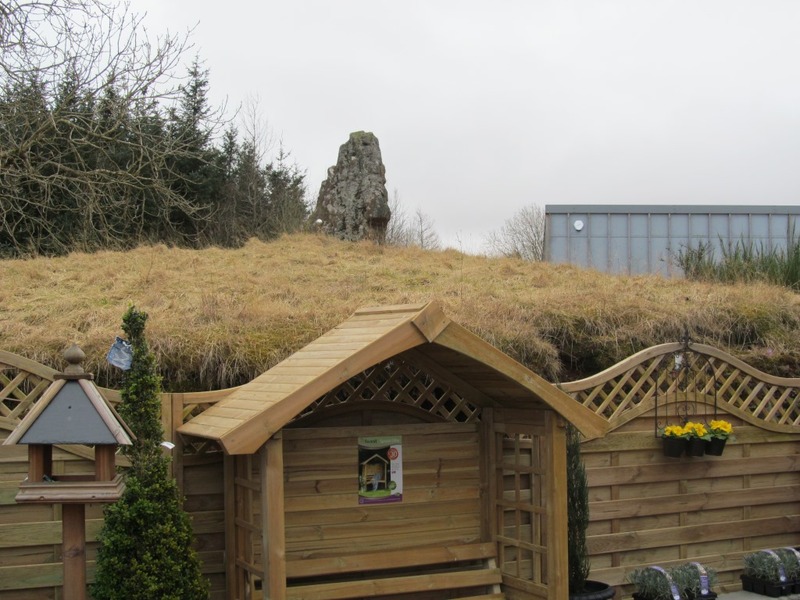 The garden centre abuts up against this artificial outcrop where enough rock was removed to raise up the standing stone, and adds another layer of connectivity between stone extraction and stone desirability. And indeed the peculiar landscape where the standing stone stands, and the garden centre nestles, is a product of quarrying. And so it appropriate that the garden centre shares this hilltop location with an aggregates company, Braidbar Decorative Aggregates. 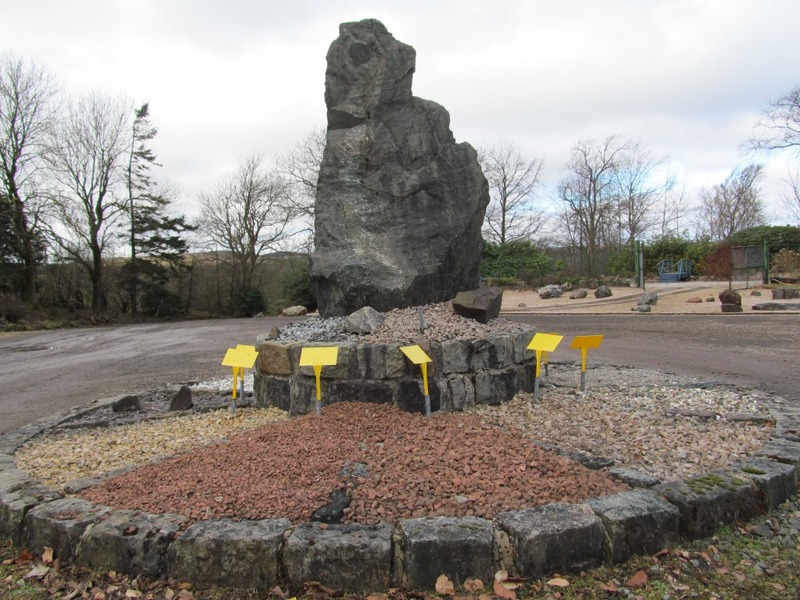 As well as offering an assortment of colourful and practical aggregates for trade and public purchase, this company has a unique monument situated within their spacious car park – another standing stone. This megalith looks almost identical to the Gowkstone situated a few hundred metres to the north, and is perhaps meant to mimic it, albeit in a darker rock type. This angular megalith sits atop, and within the centre of, a bizarre circular arrangement, from which radiate compartments filled with a range of different aggregate types, presumably those sold by the company. Each segment of this circle has a plastic yellow sign protruding from it, which I assume once had the name of the aggregate type and a price written on it, although this has long since faded. The whole effect is rather like a huge stone Trivial Pursuit counter. As I stood and wondered at this monument to aggregate commerce, a man in a van drove up to me, to stop and ask if I wanted to buy some gravel. It was with a heavy heart I said no. The man in the van drove off, and I reflected on how everything had gone full circle, and my simple fieldtrip to a garden centre had developed into a whole series of entanglements and associations that I had not anticipated. What struck me most about Braidbar was the bizarre connections and overlaps evident here which more or less all draw on the enduring desirability of stone (except for the gorilla). This place has for centuries been associated with the extraction of rock and has been entirely re-worked because of this, and the selling on of the resultant material for a range of different purposes has accompanied this. And at two very different times in the past stone was celebrated in a different way with the lowering of a big lump of rock into a hole and standing it up. The stone / people entanglements at Braidbar are evident in a range of different ways. Stone can be utilised for aesthetic purposes in gardens, for advertising bags of gravel, for adding a touch of class to a garden centre, or for all manner of pagan rituals. Yet ultimately the garden centre standing stone, the Gowkstone, looks a little lost and sad, on its unquarried prominence, perhaps itself little more than a garden feature for some long dead landowners. 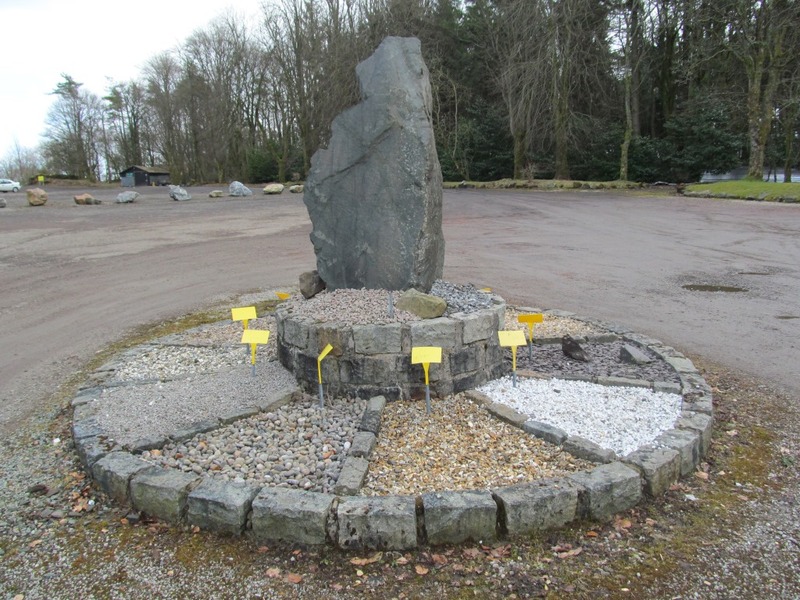 And for all the boasts that the standing stone is the garden centre centre, I am not sure how much this is appreciated by the visitors to the Braidbar garden centre as they browse through bedding plants and garden ornaments. 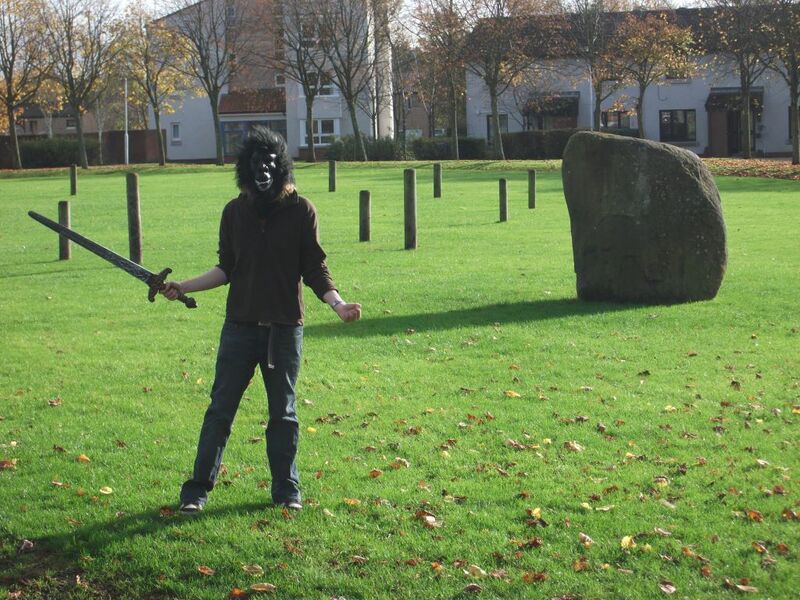 Indeed I suspect the megalith loses out in popularity and impact to the Braidbar gorilla. Perhaps to enliven urban prehistory, more use should be made of great apes…. Sources: Almost nothing has been published about the Gowkstone. The only archaeological engagement with this megalith is via the ACFA field survey of this area, and a brief report on this can be found in the National Monuments Record (CANMORE); the photo of ACFA fieldworkers came from their own website. The image of the architectural drawing of the Braidbar garden centre came from the webpage of Crichton + Simpson architects, while the 2001 movie image is available in many variants online. 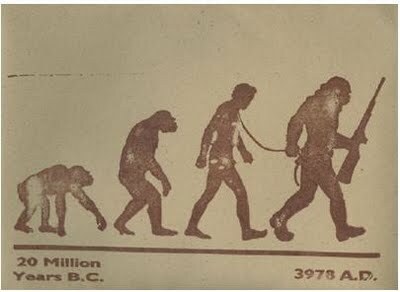 The evolutionary cartoon came from a blog which celebrates such images. 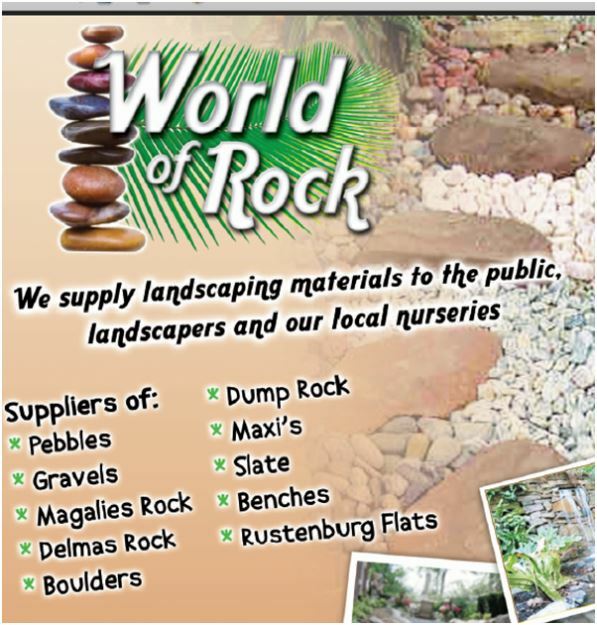 The Caulders logo came from the webpage for the garden centre, while the World of Rock advert is a South African aggregate supplier. The world is always a little bit stranger the the weirdest thing we could imagine. Although it is not megalithic Wat’s Dyke appears to be incorporated oddly into the mundane world. The Avebury circle is perhaps the place most integrated into the Modern?